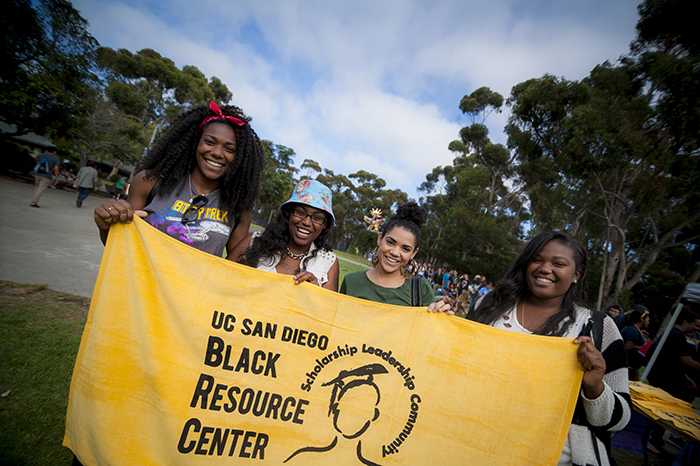 UC San Diego's Black Resource Center, which celebrated its fifth anniversary this year, is one of six campus resource centers at the university. Photo by Erik Jepsen/Publications. The University of California San Diego is one of three universities to earn the highest-ranking score in a new report card that measures how well public universities across the nation are serving black students. The inaugural survey, conducted by the University of Southern California Center on Race and Equity, graded institutions on four criteria—representation equity, gender equity, completion equity and black students-to-black faculty ratio. The report, which aims to make inequities more transparent, combines United States Census population statistics with survey data from over 500 four-year, non-specialized, public post-secondary institutions. Scores from the four equity indicators were combined to produce an overall grade point average. UC San Diego was one of three universities that earned a 3.50 equity index total—the highest grade any university received; the average score was 2.02. Gender Equity: The enrollment gap between black undergraduate men and black undergraduate women relative to the overall enrollment gap between women and men across all racial and ethnic groups. UC San Diego received an “A” grade. Completion Equity: The difference between average six-year graduation rates for four cohorts of black undergraduate students and four cohorts of undergraduate students overall. UC San Diego received an “A” grade. Black Students-to-Black Faculty Ratio: The ratio of full-time, degree-seeking black undergraduates to full-time black instructional faculty members. UC San Diego received an “A” grade. Representation Equity: Difference between the percent of black undergraduates at the institution and the percent of black 18-24 year-old citizens in the state. UC San Diego received a “C” grade. Over the past five years, UC San Diego has made many strides towards fulfilling a key goal of the campus’s Strategic Plan: cultivating a diverse and inclusive university community that encourages respectful open dialogue, and challenges itself to take bold actions that will ensure learning is accessible and affordable for all. The Black Resource Center celebrated its fifth anniversary this year, one of six campus resource centers that serve as places of belonging where all students, staff and faculty can find community, explore social justice issues, gain leadership skills, engage in open dialogue and take part in educational and social activities. Also, the African Black Diaspora Living Learning Community was recently established, a housing community that fosters personal and academic excellence through the affirmation and celebration of blackness in its various expressions. To promote the success of black students, faculty and staff, UC San Diego launched the Black Academic Excellence Initiative in 2016, with a key focus on increasing scholarship funds to provide access for admitted students. Scholarship on black life, culture and experiences was also advanced with the creation of the Black Studies Project in 2014, enriching Black Studies research, teaching and public education on campus. And in 2013, Chancellor Khosla created the Chancellor’s Associates Scholarship to improve access to UC San Diego for qualified, high-achieving students from all backgrounds. Nearly 850 students have been granted the scholarship since its inception. In addition to covering tuition, on-campus living expenses and books, the scholarship program also includes leadership development, faculty mentoring, a summer transition program and more. For the full USC Race and Equity Center report card, go here.